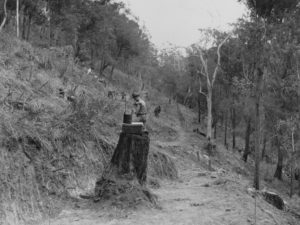 Mountain Roads – Mount Nebo Residents’ Association Inc.
John Oxley Library, State Library of Queensland, Record number: 106376, 8 August 1931. This year has seen the Residents Association(RA) engaged in multiple champagnes on road repairs. The recent repairs and improvements to the Brisbane City Council(BCC) section of the Mt Nebo Road were as a result of direct consultation between the RA and the administrative arm of the council. After a representative of the RA and a BCC road engineer walked many sections of the road, a plan was created to rectify many long standing faults in the road. The BCC have gone far beyond what was outlined and months earlier than they had promised in carrying out the works. Of course, the on going task of reopening The Goat Track to a standard acceptable to most residents, has consumed the time of the members of The Goat Track subcommittee. Their success so far in motivating the Moreton Bay Regional Council to act in an appropriate way, has demonstrated the importance of the RA to channel the feelings of the entire community towards widely accepted results. © 2019 Mount Nebo Residents' Association Inc.